Halfords Yuasa Racing drivers Gordon Shedden and Matt Neal proved the inherent pace of the Honda Civic Type R in the Dunlop MSA British Touring Car Championship at Rockingham this weekend (26/27 August), but misfortune conspired to keep the pair off the podium at the Northants speedway. Neal lapped just over a quarter-of-a-second shy of the outright benchmark in an ultra-competitive qualifying session to line up seventh on the grid, as team-mate Shedden struggled with 57kg of success ballast aboard his Civic Type R, restricting him to just 16th place. Three-time champion Neal converted that into a solid fifth at the chequered flag in race one – setting the fastest lap along the way for good measure – but fellow multiple title-winner Shedden’s hopes of adding to his points tally were dashed by a puncture on lap 11 that prompted an unscheduled trip to the pit-lane. Neal went on the attack in race two, and he was challenging for second position when contact with Josh Cook at Deene Hairpin spelt an early bath. 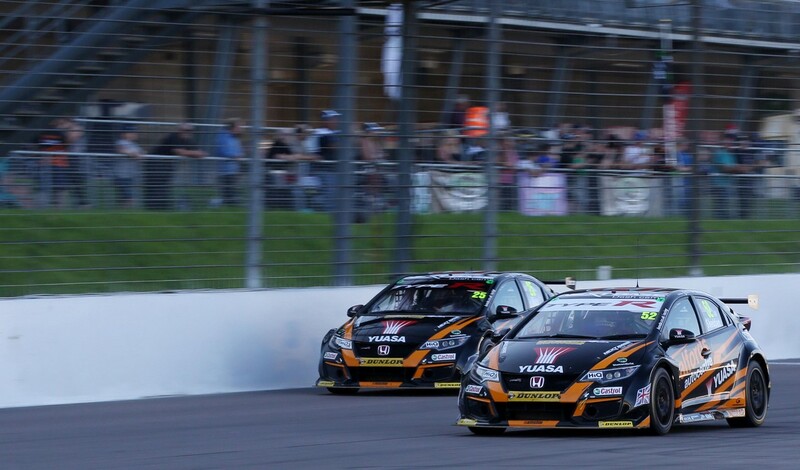 Shedden was similarly making up ground from the back of the pack when he came together with Rob Austin at the same spot, resulting in a failure to finish. Both drivers began the finale right at the rear of the grid, but fought their way grittily through the field to take the chequered flag 12th (Shedden) and 13th (Neal), ensuring the battle for the biggest prize in UK motor sport continues on to Silverstone in three weeks’ time (16/17 September).